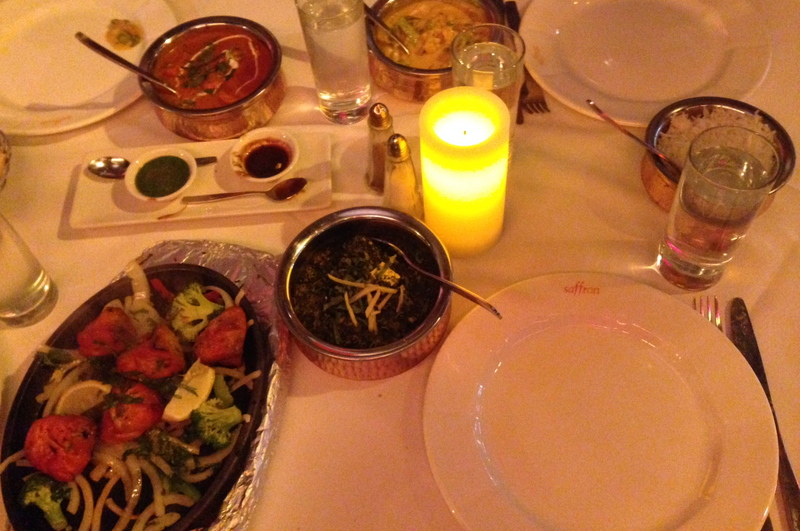 Walking into Saffron is like being transported to India without leaving New York. The dim glow of lanterns illuminates decadent tables that somehow still have a casual vibe. Conversation is hushed and intimate, but the hustle and bustle of the city is still visible outside the glass walls. I can see this being a great spot for a first date or a weeknight dinner with friends. The waiters are attentive and service is great; our water glasses were never empty for long. The menu is full to bursting with mouthwatering choices. It includes many classic Indian dishes like Palak Paneer, Koftas, Biryanis and Tandoori dishes, as well as several different variations on rice. It also features a wide range of appetizers, some of which I had never heard of before, like Chutney Scallops and a sweet and sour eggplant dish. Prices are reasonable, ranging from about $4 to $6 for breads, $3 to $6 for rice dishes, sides, soups, salads and desserts, $7 to $10 for an appetizer, and $13 to $26 for an entree. There are a wide range of vegetarian options, and because rice isn’t included with the entrees, it’s much easier for diners to make healthy choices. I arrived before the rest of my party, and almost immediately after being seated was presented with a basket of pappadams, or lentil wafers, and a selection of two chutneys. I don’t personally love them, but they were well made; crunchy and light, the perfect vehicle for the sweet and spicy sauces that accompanied them. After looking over the menu, my table ordered the Samosa appetizer, Tandoori Vegetables, Chicken Tikka, Chicken Tikka Masala, Palak Paneer, Navratan Korma, and plain Jasmine Rice. Clockwise from top left; chicken tikka masala, navratan korma, jasmine rice, palak paneer, chicken tikka, chutneys. Not pictured: Tandoori Vegetables and pappadams. I have to apologize for the photography in this post, because I was really hungry and definitely rushed the process. Nonetheless the presentation was fantastic, both aesthetically and practically, even if it’s not evident in the photos. The metal bowls were not only pretty to look at, (and would make a smashing addition to anyone’s instagram feed, #foodporn) they also kept the food hot for a longer period of time. As far as taste goes, the presentation was outweighed only by the delicious flavors and textures I experienced. 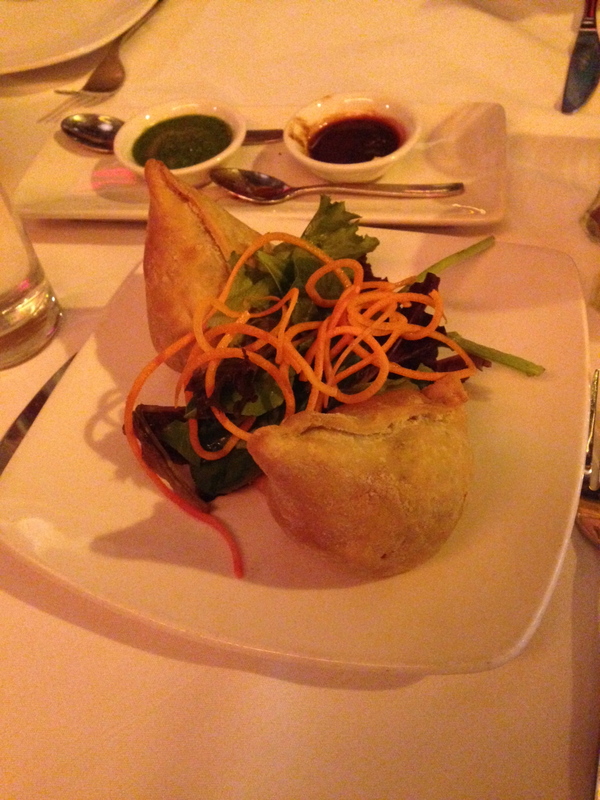 The samosas were the perfect balance of crunchy, flaky dough on the outside with a perfectly cooked moist filling. The seasoning was also out of this world, and I found myself wishing we had ordered more. As for the entrees, everything I sampled was equally delicious, and though I can’t vouch for the chicken dishes, my table mates assured me they were fantastic. For all the entrees we ordered, we were given a choice of how spicy we wanted them, and we decided on medium for all. I think that was the perfect decision, because it gave the food a slight kick while still allowing the complexity of the flavors and spices to come through. The palak paneer and tandoori vegetables were probably my two favorites, but the navratan korma was delicious as well. I think we all agreed that it could not have been better, and I think Saffron is probably home to the best Indian food I have ever tasted. So there you have it. If you’re in the mood for Indian, try Saffron for a delicious lunch or dinner. They also deliver, in case you don’t want to leave the comfort of your apartment. And I’ll be the first to admit, when winter comes and I’m in need of a little comfort food, Saffron will be the first place I call. 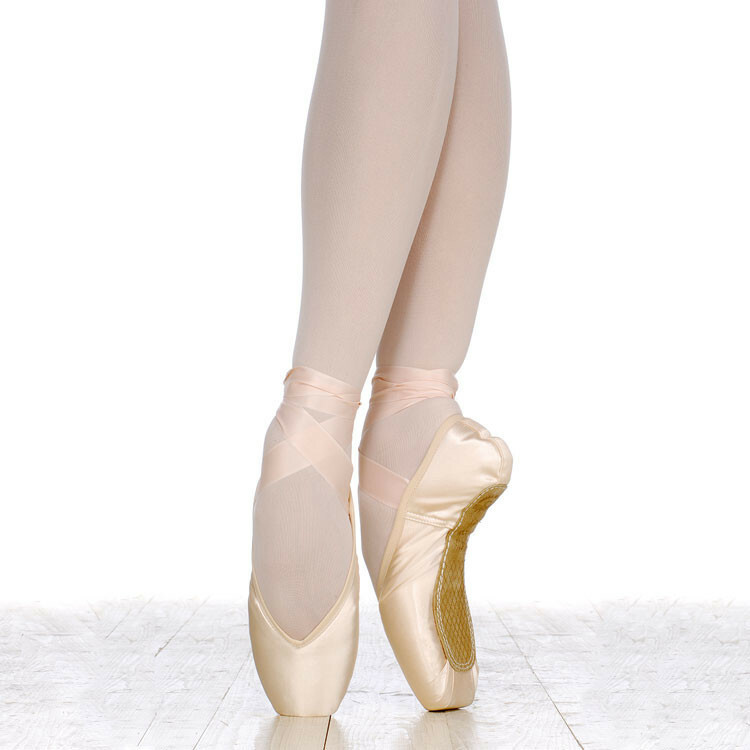 You can check out their website here for more information.